I've made it to the Nursery! Just as the High Dependency Unit was much quieter than the Intensive Care Unit, the Nursery is much quieter than High Dependency. It's a lot cooler too, which must be a big relief for Mum and Dad although it means I have to be wrapped up in about four blankets all the time. I arrived in the Nursery a few hours before my friend left to go home. For a while it was like the old times in the Intensive Care, and we lay in our cots and made noises at each other. His Mum and Dad looked very happy, and I think all the Nurses were too (although some of them were a bit sad to see them go because they're such nice people). It's good to see babies going home from here, and I'm very pleased for them all. Mum and Dad have been putting off doing a lot of things by saying "We'll wait until he's in the Nursery". I think they didn't want to sort things out for me in case I didn't do quite as well as I have. Looks like they're going to be busy now though. Aunty Cheryl and Aunty Jan also came to see me today. Aunty Cheryl was very surprised to see me in the Nursery, and they stayed until Mum and me had to go off to feed. I've been doing pretty well with my feeding; the main problem is that I'm easily distracted. This afternoon, I was captivated by a fascinating set of beads in the curtain just beyond Mum's shoulder, and it took a good five minutes before I remembered I was hungry. 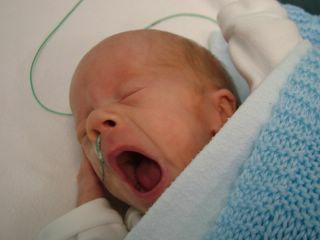 After my feed I was very sleepy and couldn't stop yawning. William, I am even more proud of you than i was when i posted the last message! It must be all so exciting to be in a new room and a new bed and everything! Well, lots of love to you, and lots of love you your mummy and your daddy too! William Rhys you are doing fab! Well done little one, we are all very proud of you for coming on so well. Good job you've been born with a good dose of Horrocks/Margetts stubborness in you! At this rate you will have achieved your cycling proficiency by the time i see you next. Well little man, we won't be able to call you that for long will we? How fab! Though I did like the idea of the water mattress, but I guess, the new cot might not be a wibbly, and at least it's quieter. Good job little man, you keep making ya Ma and Pa proud. Well done my lad! How exciting!!! the nursery - that's like going up to the next key stage (teacher speak) - whooah! 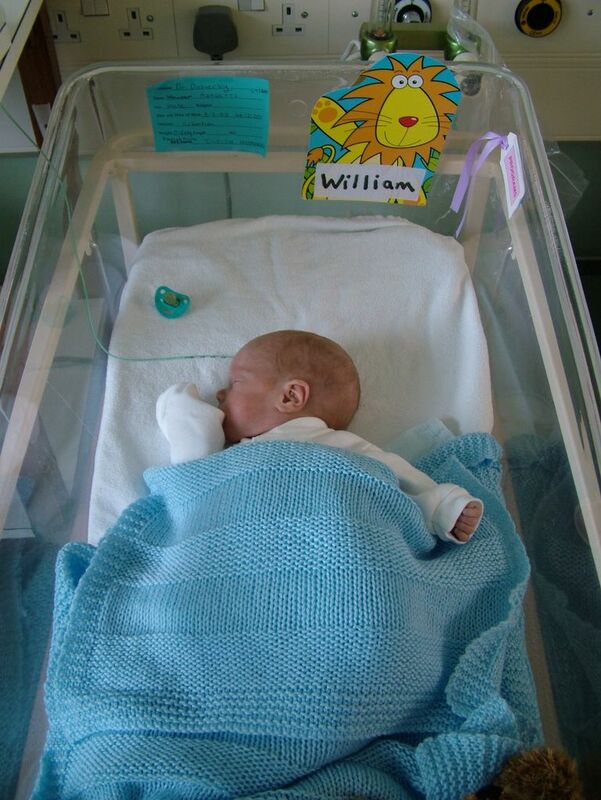 Very proud of you and a pat on the back for clever mummy daddy, nurses and doctors - obviously good genes and a lot of love around you William - don't worry you can reward them with clean nappies and blowing bubbles! hello! nice to see you doing so well! Excellent news on the move to the Nursery Will and particularly in seeing off the breathing machine. Glad to hear you've been doing a bit of socialising too.